PCIE NAND Flash IC Programmer For iPhone 6S Plus 5 SE i-Pad. PCIE Nand Repair Machine is a SN change tool. JC PCIE repair machine Support repair WIFI, Hard disk automatically detect. New JC PCIE N3 is released! JC Pro1000S PCIE Module not only can working on JC software, but also can working together with JC pro1000S Programmer. Note: Before you using the software, please install the lastest itunes software, if your itunes version is too old, you should update it. Software support: Win7/8/10 64bit , also support on 32bit OS. 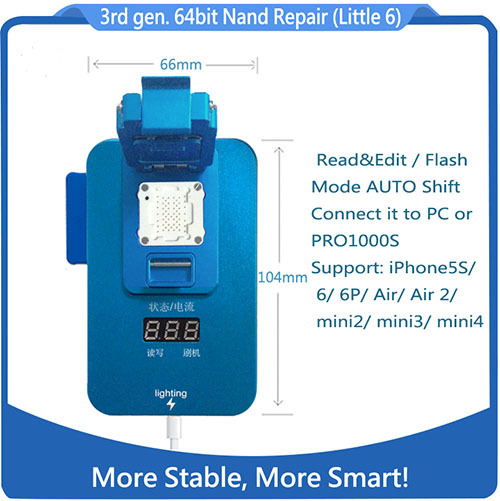 JC 64BIT PCIE Nand Repair Tool is for repairing iPxd Air Air2 Mini Mini2 3 4 and iPhoxe 5S 6 6P nand flash ICs. 1. Perfectly read/ write the nand SYSCFG data file to repair iTunes Errors. 2. AUTO shift Read/ Write Mode or iTunes Flash Mode. 3. Delete the SYSCFG data file of the nand flash ICs by one click.